Chandelier earrings are no mere fad. This unforgettable style has become a fashion staple in short order, in part due to incredible versatility. In fact, you can use the same techniques for creating chandelier earrings to create a fabulous complementary necklace. 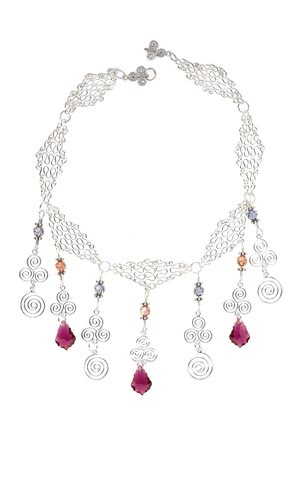 Combine sterling silver with Swarovski crystal to create a necklace that's a delight to the senses. Determine how long you'd like your necklace to be then determine how many components you'll need to complete your necklace; every squiggly piece with a jumpring is 2 inches. To link components together, I like to use jumprings. To open a jumpring, place a pair of chain-nose pliers or flat-nose pliers on each side of a jumpring, then move one plier away from you while holding the other one stable. Slip a ''squiggly'' component and one end of the clasp onto the ring; close the jumpring. When closing, gently press the ends of the ring toward each other; this will give you tension against the joint when the ring is closed. Connect all the squiggly pieces with jumprings to form the base of the necklace; finish with the other side of the clasp. Now it's time to make the drops, you will need 3 red drops and 4 purple drops--both styles have a crystal bead oriented vertically, with two wire loops on the end. There are many ways to make loops; after years of twisting wire every which way, I found this way to be easy and durable. Cut the wire into 1-5/8 inch sections, cut enough for all the drops you'll need. I try to make my loops all the same size--to help with this, I mark my pliers and place the wire on the mark every time. Place the wire into the pliers at the mark and about 2mm down from the end of the wire; make a 90 degree bend (the bend needs to be long enough to accommodate a crimp bead later). After the bend in the wire, make a loop using round-nose pliers. After the loop, bend the wire so it is parallel with the first bend in the wire. Add the top loop of the 3-spiral component to the loop made in Step 5. Add a crimp bead, slide it up until it covers the both wires coming out of the loop and flatten the crimp with the chain-nose pliers. 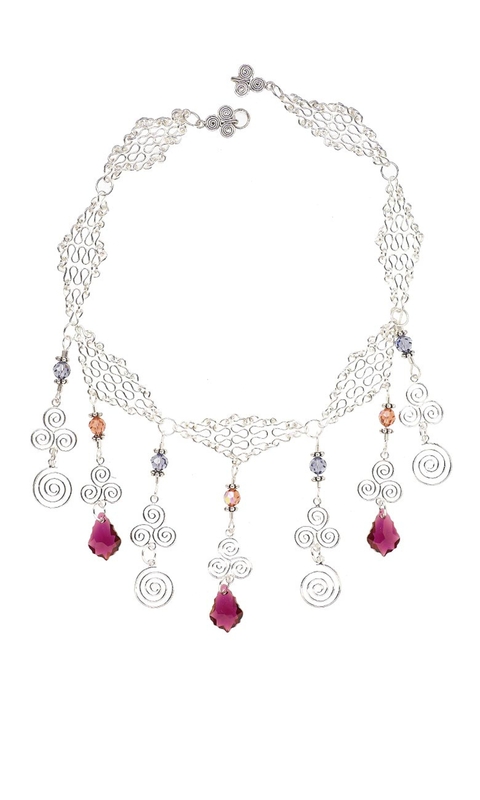 Add a sterling silver rondelle, a padparadscha crystal bead (or purple bead), a sterling silver rondelle and another crimp bead. Bend the wire below the crimp bead, 90 degrees. Make a loop with round-nose pliers. Bend the wire parallel to the crimp bead. Cut the wire, leaving 2mm to fit into the crimp bead. Grasp the 2mm end of the wire and manipulate it into the crimp bead, be careful not to demolish the shape of the loop. Flatten the crimp bead with pliers, voila, a pretty cool loop! Connect components to the drops using a jumpring--on the padparadscha bead add a red drop and on the purple bead add a spiral component. Once you have your drops made, it's time to start connecting the drops to the base. The red drops attach in the center of the squiggly parts and the purple drops attach to the jumpring connecting the squiggly parts. You'll find the end of the wire in the middle of the squiggly component, shaped in a loop; open the loop, slip on the top loop of the red drop, then close the loop firmly. Attach the other two red drops in the same manor. Attach the purple drops to the jumprings in between the squiggly parts--you are done!